But the city of Mandalay is 400 miles north of both Moulmein and Rangoon, and a good 200 miles inland... There is a subsidiary puzzle, about dawn coming up 'outer China 'crost the Bay', since the Bay of Bengal and China lie respectively to the west and north of Moulmein. I take it that 'comes up like thunder' likens the sunrise to a sky full of thunder-clouds; but to an observer in Moulmein dawn would surely have come up overland from the east, out of Siam. That Kipling was disorientated is confirmed by the fact that, in the original version of the poem, the first line read: 'By the old Moulmein Pagoda, lookin' eastward to the sea, on which the passage in Murray's Handbook [page 710] mentioning two pagodas at Moulmein comments drily in parenthesis, '(not "looking eastward to the sea")'. Wait a minute. "Broad"? That doesn't sound like Kipling. Well, no. And Frank's improvisations did not sit well with the keepers of Kipling's flame, as we'll discover. That makes two more mentions than most South-East Asian cities get in the Sinatra oeuvre, and one more than Singapore (as in "On A Little Street In...", recorded by Frank with the Harry James band in 1939). The only reason Lenny Adelson and Imogene Carpenter were namechecking Mandalay in American pop songs in 1953 was because Kipling had put it on the map. It was one of those select group of places (Timbuktu, for example) that in America had become, somewhat oxymoronically, a familiar, household name for somewhere unfamiliar and remote. 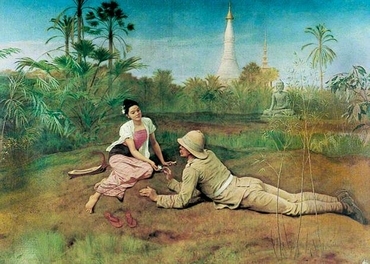 When I die I will be a Burman, with twenty yards of real King's silk that has been made in Mandalay, about my body, and a succession of cigarettes between my lips …and I will always walk about with a pretty almond-coloured girl who shall laugh and jest too, as a young maiden ought. She shall not pull a sari over her head when a man looks at her and glare suggestively from behind it, nor shall she tramp behind me when I walk: for these are the customs of India. She shall look all the world between the eyes, in honesty and good fellowship, and I will teach her not to defile her pretty mouth with chopped tobacco in a cabbage leaf, but to inhale good cigarettes of Egypt's best brand. If you've 'eard the East a-callin', you won't never 'eed naught else. Very true. Speaks' setting was taken up by singers throughout the Empire, but none was more associated with the song than the great Aussie bass-baritone Peter Dawson, who sang "On The Road To Mandalay" for some four decades. He sang all kinds of other things, too, but "Mandalay" was special. He liked the words so much he recorded them not only to Oley Speaks' tune but also to Walter Hedgecock's. And in 1945 he made a "Mandalay Potpourri", a six-minute mélange of Kipling's verses in settings by Speaks, Hedgecock, Gerald Cobb and Charles Willeby. Three years later Burma quit the Empire. I mean, for real - not like India, Pakistan and Ceylon, graduating to Dominion status within the Commonwealth. Brimming with post-war resentments against their imperial masters, Burma just checked out: One minute it was a Crown Colony under the King-Emperor with Sir Herbert Rance as Governor. Then the Union Flag came down and it was a sovereign republic with Sao Shwe Thaik as president. The hereditary Saopha of Yawnghwe, Shwe Thaik died in prison shortly after the 1962 coup - and his saophasate (saopharate?) was abolished, and Burma lost to the world. And so it might have gone for the great song of imperial romance, too. But on October 1st 1957 Frank Sinatra walked into the studio for the first of three sessions spread over eight days in which he would record his first album with Billy May: Come Fly With Me. You'll know the cover art: Sinatra, hat on head, taking the hand of an unseen lady and beckoning her toward the steps to the jet behind. Frank disliked it, and told his producer, Voyle Gilmore, that it looked like an ad for TWA. But it captured the spirit of the title song, and the set as a whole: "London By Night", "Brazil", "Blue Hawaii"... All fine charts by Billy May, but the album's masterpiece was, of all things, "Mandalay". What was it Kipling said? You didn't need to be east of Suez to raise a thirst: Billy May drank at the conductor's podium during the Fly With Me sessions. But the end was difficult. Maybe, for once, May should have worked on it a little longer. "Billy had written the arrangement," percussionist Frank Flynn told Sinatra historian Chuck Granata, "so that when we got to the line that says, 'And the dawn comes up like thunder', I would hit this huge gong as a punctuation. Then the arrangement would continue for about another half a chorus." And Frank Flynn whacked that gong. Billy May signaled to the band not to play a note, and the musicians looked to Sinatra to pick up the ending. And then, as his lead alto Skeets Herfurt recalled to Will Friedwald, "Instead of going on, Frank put on his hat and threw his coat over his shoulder, like he does, and walked out of the studio! We all laughed like mad. We said, 'What's happening? Is Frank going to come back and do it again?'" No, he wasn't. The gong was still reverberating and the singer was in the corridor. And that's how they released the track - with Sinatra's improvised ending. It's a great record. Oley Speaks never heard it - he died in 1948 - nor Rudyard Kipling - he died in 1936. But Kipling's daughter, Elsie Bambridge, heard it, and strongly disliked it. And she forbade the inclusion of "Mandalay" on the Come Fly With Me LP throughout the British Empire. In the United Kingdom, it was replaced with a goofy Capitol single, "French Foreign Legion" (by Guy Wood, who also wrote the Sinatra masterpiece "My One And Only Love"). In Australia and elsewhere, they substituted "Chicago", and some parts of the Commonwealth wound up with "It Happened In Monterey". This particular song was written from the poem by Rudyard Kipling. Now it seems that we have done a rather different version of 'Road To Mandalay', so that his family has objected, and anywhere in the British Empire it's not to be played on the record. So they took it off the long-playing record of Come Fly With Me and replaced it with 'Chicago'. But this is an unusual version of 'Road To Mandalay' - it's comedic, but it swings, it jumps. I think that Rudyard Kipling's sister [sic] was chicken not to let us put it on the record. Peter Dawson was still around in 1959 - in fact, he'd made his last studio recordings in London only four years earlier. I wonder if he caught Sinatra on that Aussie tour, and, if so, what he made of the Egg Foo Yong Pagoda. Maybe they had one in Adelaide. Elsie Bambridge died in 1976. And shortly thereafter "On The Road To Mandalay" was restored to its rightful place on British pressings of Come Fly With Me. And you'll be a man, my son! In 1966 Sinatra made his first ever spoken-word recording, of another of Kipling's Barrack-Room Ballads, "Gunga Din". He wasn't happy with it, and it remains unreleased, but, if Sinatra wants to record poetry, better Kipling than Rod McKuen. Maybe there's a Burma broad a-settin', after all. ~For an alternative Sinatra Hot 100, the Pundette has launched her own Frank countdown. She's reached Number 78, a lovely trio version of "Autumn Leaves" - Frank's voice, Al Viola's guitar, Harry Klee's flute, recorded live at London's Royal Festival Hall in 1962. Mark tells the story behind "Autumn Leaves" in his book A Song For The Season. 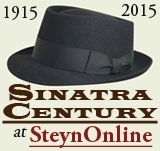 And don't forget Steyn's original 1998 obituary of Sinatra, "The Voice", appears in the anthology Mark Steyn From Head To Toe. Personally autographed copies of both books are exclusively available from the Steyn store. ~Bob Belvedere over at The Camp Of The Saints is also counting down his Top 100 Sinatra tracks, and eschews Mandalay for Brazil, where they've got an awful lot of coffee. Evil Blogger Lady is also getting in on the Frank festivities, and eschews Mandalay and Rio in favor of Sorrento.